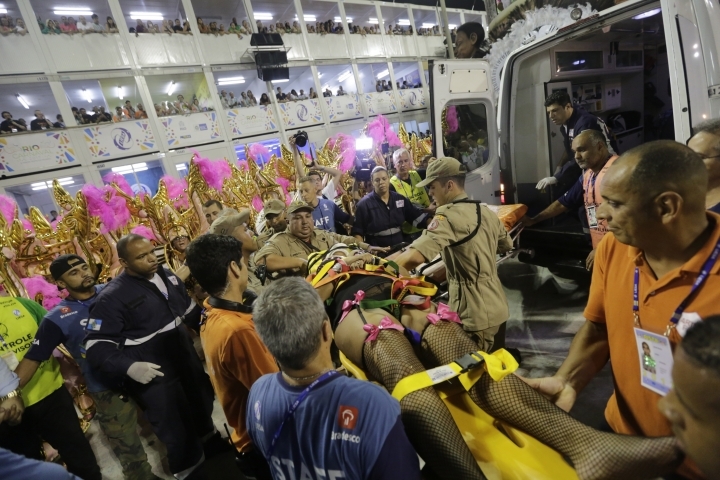 RIO DE JANEIRO — The top of a float collapsed during Rio de Janeiro's world famous Carnival parade early Tuesday, injuring at least 12 people, officials said. 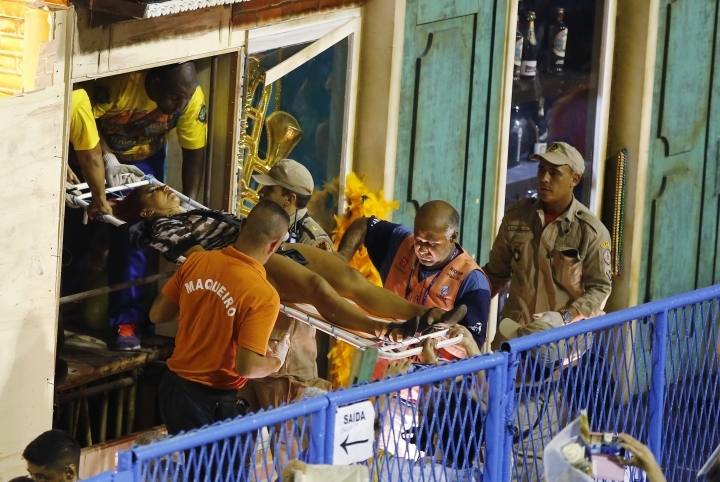 The incident involved the second float of the popular samba school Unidos da Tijuca, themed around the Carnival in New Orleans. Revelers cried on the pavement and in the stands as injured people were removed by rescuers. Rio state health secretary said in a statement that among the 12 injured at the city's Sambadrome, nine were taken to local hospitals. Health officials also said eight people sought medical attention due to stress. Rio City hall said two people were in serious condition. One suffered a head trauma, according to one doctor. The parade had to be stopped for almost 25 minutes so the injured could get medical attention. The show was allowed to proceed. Reveler Felix Souza said he was dancing next to the float when the incident happened. "We heard a burst on the top," he said. "People started screaming, we didn't understand what it was. It was a moment of despair for all there." Ailton Freitas, a director at Unidos da Tijuca, said their floats had been tested repeatedly before the Carnival. "We tested three times a week with more weight than we carried today. When the parade approached we started doing those tests every day. We are even more shocked than you all are," Freitas told journalists. "I don't know what is happening, but Rio's Carnival is not being blessed this year." Minutes earlier a smaller incident happened with samba school Mocidade Independente. A platform detached from their fourth float and dropped a reveler to the ground. 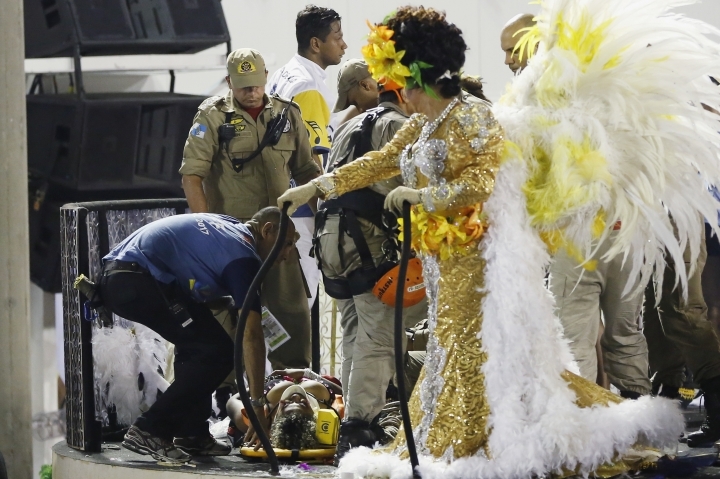 The samba school said she was not injured. 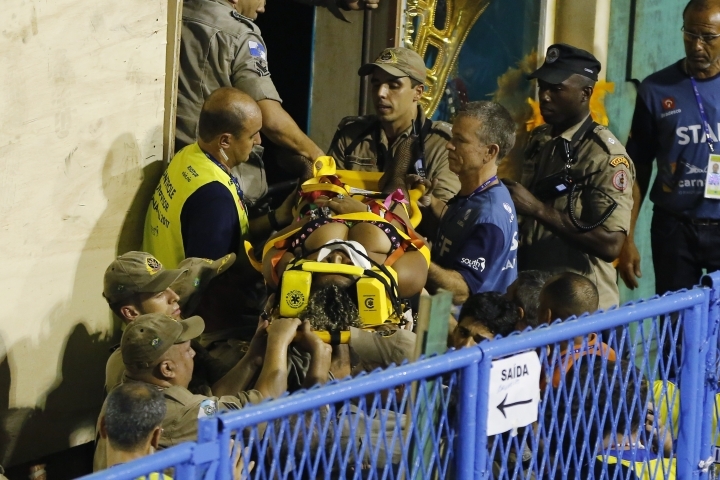 On Sunday, a float belonging to samba school Paraiso de Tuiuti crashed and injured at least 20 people, including three seriously. Following that accident, organizers also decided to proceed with the show.